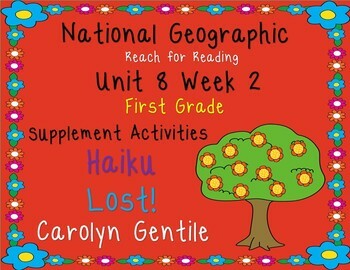 National Geographic Unit 8 Week 2 1st gr. Haiku Lost! Pg. 3 Use It! – See how many vocabulary words you can use in sentences or a short story. Pg. 9-10 Which Way Do We Go? – oi / oy practice Color the spelling words that are spelled correctly. Write the spelling words in the correct boxes. Pg. 11-12 Color the Peaches – color the peaches depending on if they are spelled with the ow sound or the ou sound. Write the spelling words in the correct boxes. Pg. 15-17 Comparing Poems – Copy pages A and B back to back to form a book. Compare the poems Haiku and Lost! Circle the different aspects of the poems. On the back of the book tell which poem is your favorite and why. Pg. 18-20 Finish the Haikus – Copy pages A and B back to back to form a book. Read each Haiku and write the last line for it. Pg. 21 Once When I Was Lost – a chance to respond to a poem in writing. Pg. 22-26 My Neighborhood Haiku Poem – A chance to write your own Haiku poem. There is a rough draft for the students to practice on first. Have the students rewrite it onto the poetry paper. 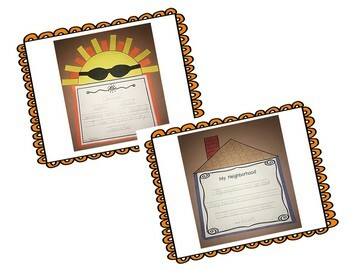 Copy off the patterns onto the appropriate colored paper and put the house together as seen in the example. Pg. 27-33 Summer Cinquain Poem – Teach your students about another type of poetry that might be a little bit easier for them to write. This also has a rough draft paper. They can copy the final poem onto the sun paper. The theme is summer – since it is almost here! They could use that as their subject or for example Sun, Beach, Vacation… etc. 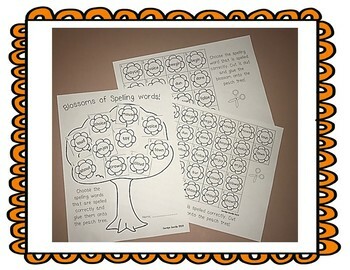 Copy the patterns onto the appropriate colored paper and put together as seen in the example. Pg. 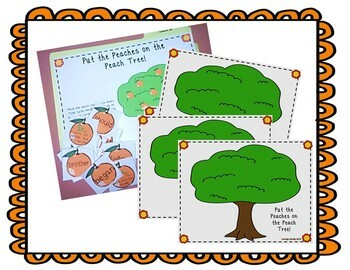 34-42 Put the Peaches on the Peach Tree – A fun game to practice the high frequency words. Can be copied onto cardstock and laminated. The simple directions are on the game.